Confession Time… Teddy Bears. Yes, I’m admitting here on my blog that I love them and always have. Just can’t help myself. I’m the one that coos at a bear I pass in a shop, just like others may at newborn babies. My own bear came to my wedding dressed in the same waistcoat and bow tie as the other ushers. He celebrates his birthday each year and used to have a cake made by my mother (who, for some reason, has stopped… RUDE!) Whilst my friends favoured their Tiny Tears dolls, Sindys and Barbies, I had my bears. Dolls did not make me ooh and ahh, or chat or dance about. I’m of the same opinon as the late actor and writer Peter Bull who once said, “Dolls stay where they are put all day long wondering what they will wear next.” How boring to be a doll. So, what’s brought on my sudden confession? Well, it’s the very sad news that the lovely Michael Bond has died aged 91. The wonderful creator of one of my favourite most bears EVER – Paddington. 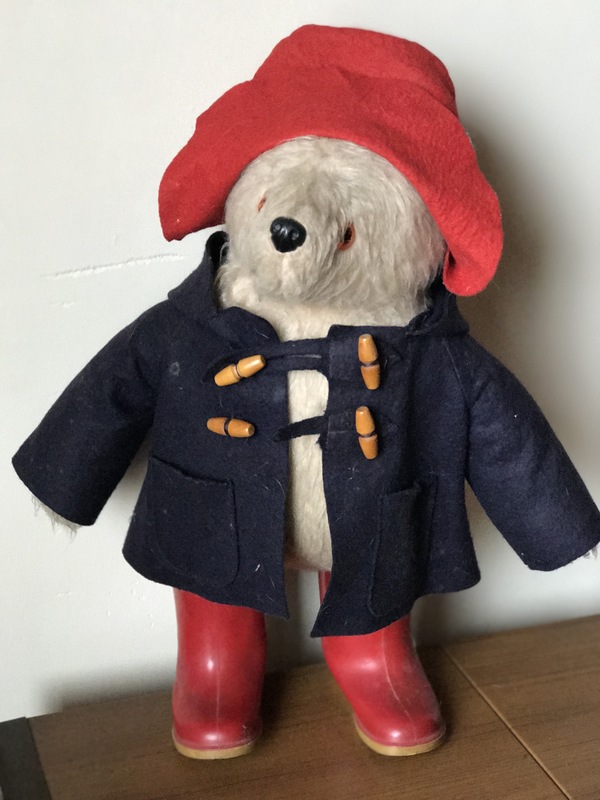 When I was very young I acquired a real Paddington Bear. I can’t remember how old I was but, from my handwriting on a little slip of paper I placed in Paddington’s Duffle Coat pocket, I would guess I was about 8 or 9 years old. The most exciting thing about my new friend was the fact he was wearing real Wellington Boots, ones that would have fitted an actual toddler. I used to dream that, one day, my own child might wear those wellies. I forgot about it when the time came, and my daughter has long escaped the threat of putting on his little boots seeing as her feet are now longer than my own. I would sit for hours cuddling my friend, despite him having quite a hard body and being a little lumpy/bumpy, and I would take his duffle coat off, put it on, take it off again until I was bored. The first Paddington story was published in 1958 by Mr Bond and he kept writing until his death with the most recent being published in April this year. His famous bear was named after the train station in London and he once said, ‘I think names are important. Sometimes they are all you have in the world’. I love names too. And, having written an impressive 200+ books, he sold over 35 million worldwide. What a writer, and what a bear! The inspiration for his stories came from having spotted a lone bear in Selfridges one Christmas which he couldn’t resist taking home. Paddington became part of his family and he said about that chance encounter, “There are some avenues in life that feel as though they are meant and there are others that are simply a matter of chance. Occasionally, very occasionally, there is a happy combination of the two.” And so it was that Paddington was born and, like many other fans of the marmalade-sandwich-eating bear, I will be eternally grateful to this wonderful writer and wonderful man. Does your Paddington still have a marmalade sandwich under his hat as well? If so, will it be coarse cut, thin cut or shredless? Will it be Orange or Lemon or Lemon/Lime flavoured marmalade? From your Number 1 fan.